A white horse is wandering in Osaka City! Look at the picture above. A street car as usual? 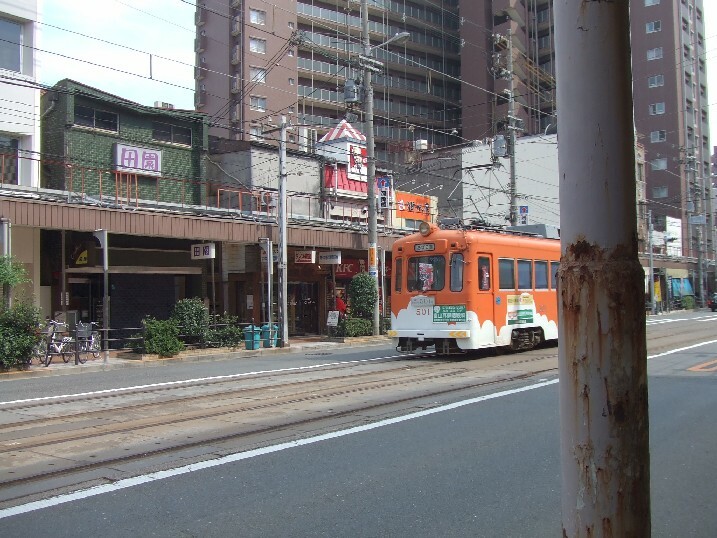 The destination is Abiko-michi (あびこ道), which is near my house, but there is no place and scenery appearing in the picture in Osaka. This picture was taken in Edmonton, Canada! I found some pictures in SNS (mixi) site. 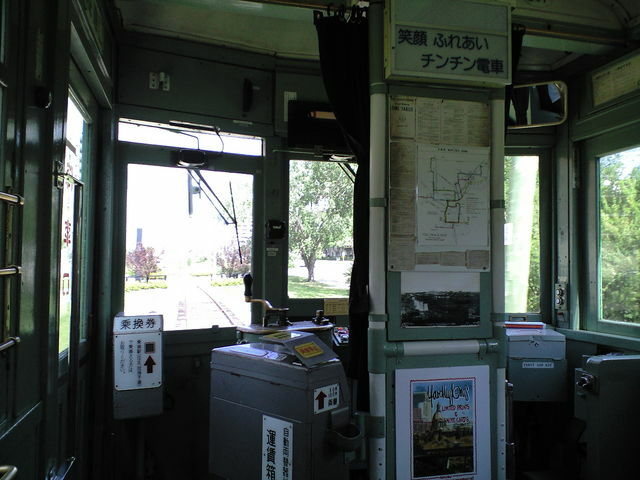 A graduate student from Kyushu is now studying in Edmonton, and he took some pictures of a street car. 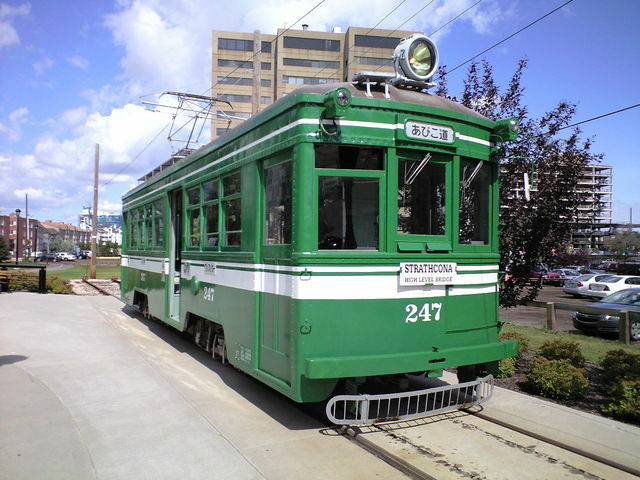 They use the old street cars that Hankai Railways doesn’t use any more. They don’t repaint or renovate so much in Canada. It is almost the way it was in Osaka. 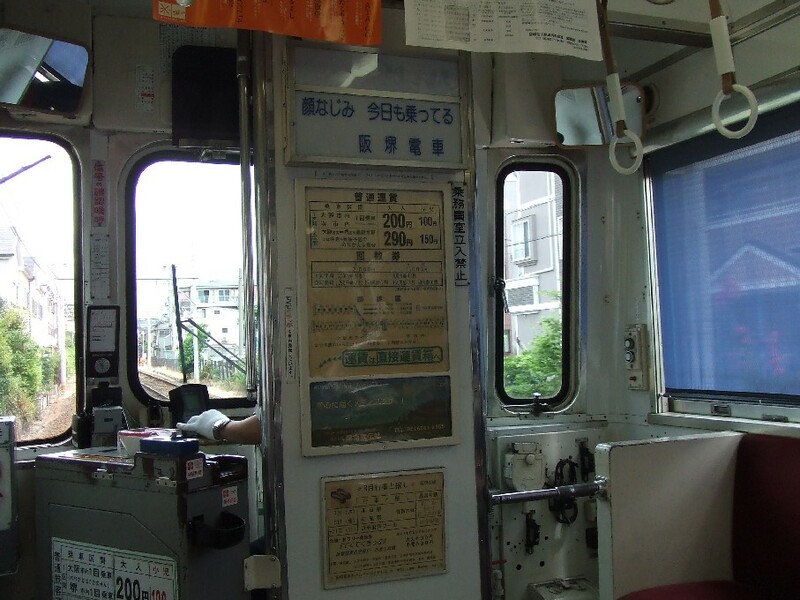 And inside of a street car in Osaka, Japan. I sometimes go shopping to Tennoji. It takes about 15 minutes by bike from my office, but it is TOO HOT these days. So I took the street car on this day. It costs 200 yen one way. Very eco-friendly! 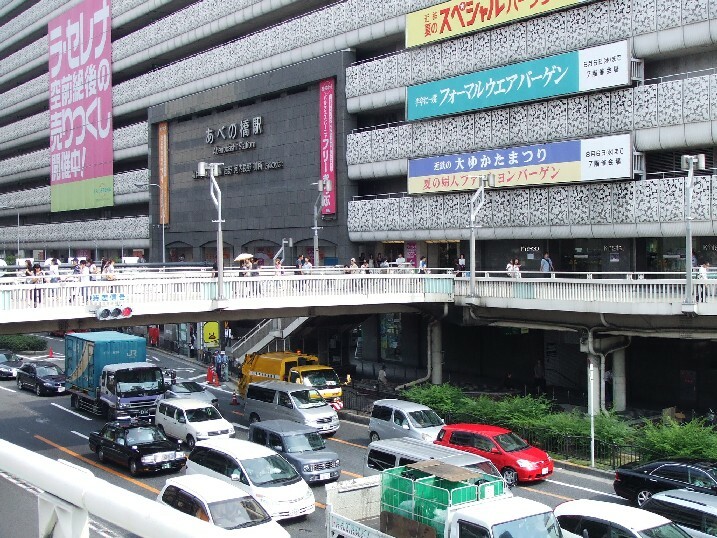 There is a big department store called Kintetsu, and some shopping center. To go to Namba and Umeda, I feel I have to wear “proper” clothes, but to go to Tennoji, I feel it’s OK to wear very casual clothes. 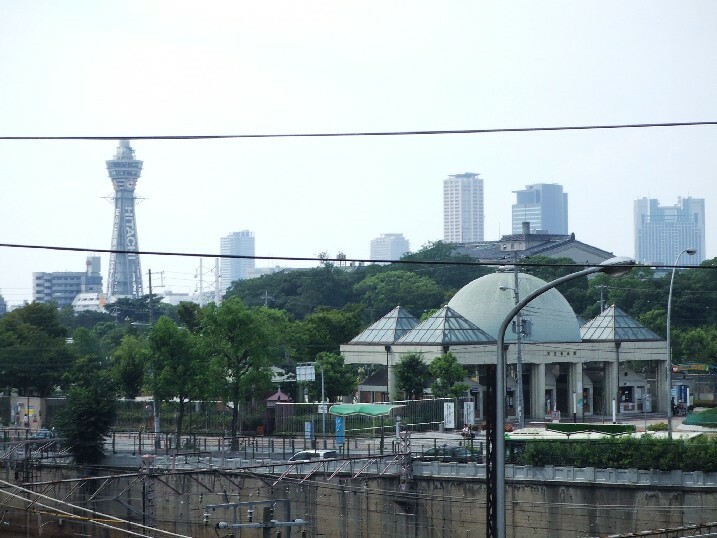 You can see the famous “Tsutenkaku Tower” beyond Tennoji Park, from the overbridge. Tall buildings in the distance are in Namba area. Black lines? They are electic wires. 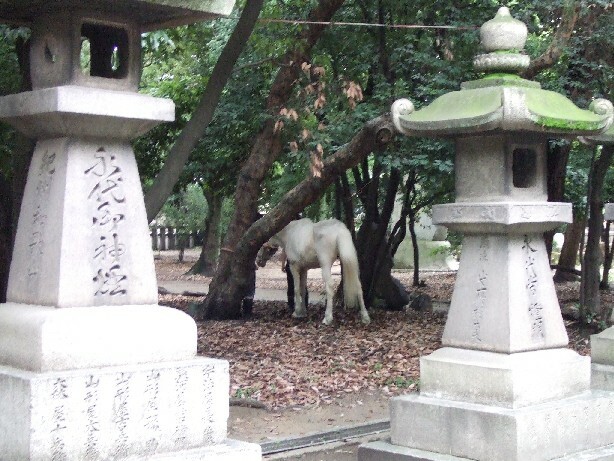 One day in July, a white horse was wandering in Sumiyoshi shrine in Osaka City! 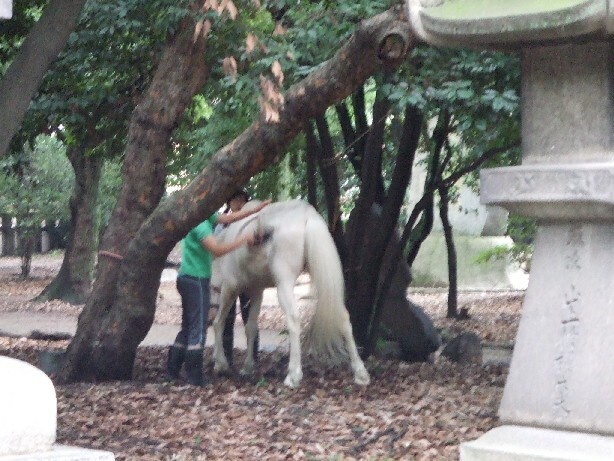 Well, this white horse belongs to Sumiyoshi Shrine, and usually he (or she) is kept away from this shrine, because of there is only a small space for him (or her). Around the time of important events, this horse seems to come back to the shrine, and is put into the very tiny stables. So he ( or she) needs to be outside and be well taken care of. This white horse was here for Summer Festival called Sumiyoshi Matsuri, one of the three biggest summer festivals in Osaka, which is annually held from July 30 to August 1. When I was a child, I liked to see the parade and see the white horse. He (or she) must be a different white horse from the one that I used to see! 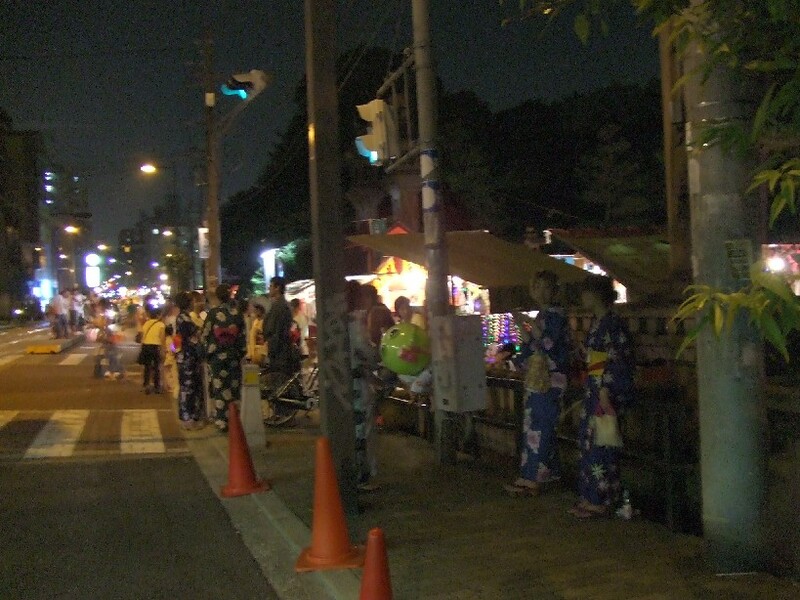 This photo was taken just outside of the shrine during Sumiyoshi Matsuri. Yukata, Japanese summer kimono is very popular to go to summer festivals.